I am a total Aveda fan at the moment and I’m sure you have seen how their Smooth Infusion products have totally transformed my hair. Seriously, I love how their products feel so natural and they work! If you don’t know yet, the art and science of pure flower and plant essences is the core of Aveda. Its beauty products are alive with the life force of plants and Aveda goes to exceptional lengths to be respectful to the earth. Ever since a hairstylist founded Aveda in 1978, Aveda’s beauty products –haircare, skincare and aromas-have been professionally developed and clinically tested, delivering high performance products that balance beauty and well-being for each individual. 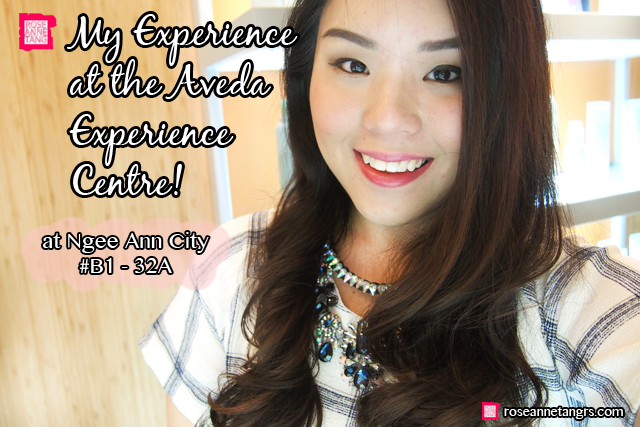 If you haven’t seen it yet, Aveda has their very own Aveda Experience Centre here in Singapore at Ngee Ann City, probably the most prominent shopping mall on the popular Orchard Road. I thought I’d pay a visit and experience the place for myself. Embodying the Aveda service philosophy, every guest here experiences total beauty and wellness through a series of complimentary Aveda Rituals that help relax and nurture. These include Tea Ritual, Aroma Sensory Journey, Stress-relieving Hand Ritual, Skin Care Ritual, Hair Styling Rituals and consultations. Each guest will have a professionally trained advisor, also known as a daymaker, guiding them through the rituals to ensure that they have the best experience possible. The advisors are called daymakers as they strive their very best to make the day of each and every guest at Aveda. 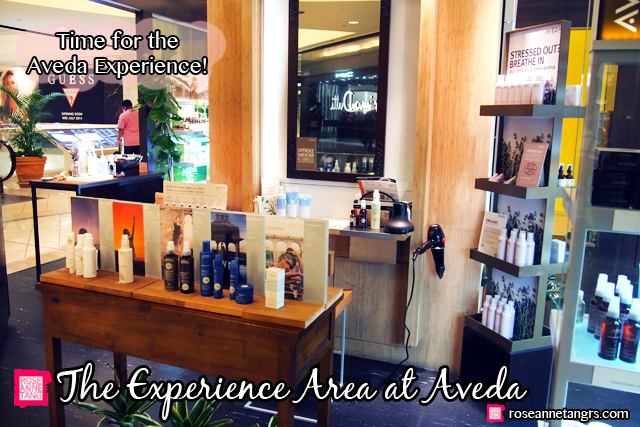 As you can tell, The Aveda Experience Centre certainly isn’t just a store. 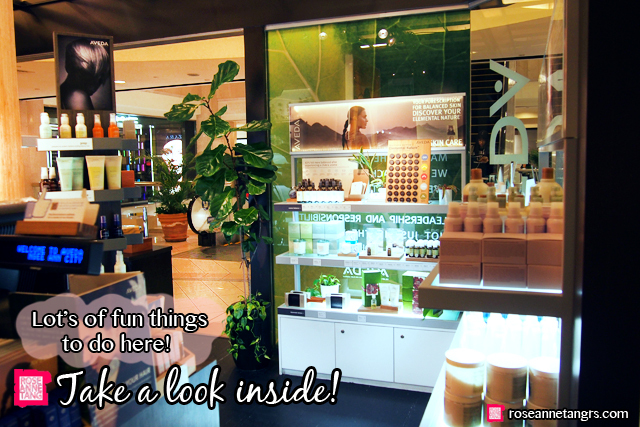 It’s a place where you can really get to know Aveda and what they’re all about. 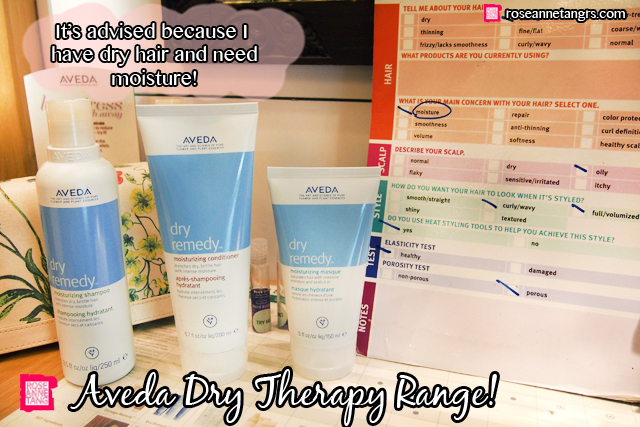 I was swept to the Experience Area to try out the Aroma Sensory Journey and the Hairstyling Ritual to see how other products from Aveda fare on me and also to discover more about my hair and scalp. After I was seated, the lead daymaker started me off with the Aroma Sensory Journey as Aveda strongly believes that the power of touch, breath and aromaology can be combined to give guests the mental, physical and emotional relief that the body needs. That is why Aveda believes in starting every guest’s Experience Centre journey with an aroma catered to each guest’s preferences and needs. The Aroma Sensory Journey bestows a profound sense of well-being through an exclusive collection of aroma naturally derived from flower and plant essences. Here we have the Blue Oil Concentrate that comes in a rollerball applicator and houses certified organic jojoba oil, meadowfoam sea oil and peppermint oil that help with mental and physical stress. The lead daymaker massaged this into my temples, behind my ear and down my neck. It was so relaxing and I could totally get used it. She also applied it to my palms so that I could inhale and exhale to relax my mind. 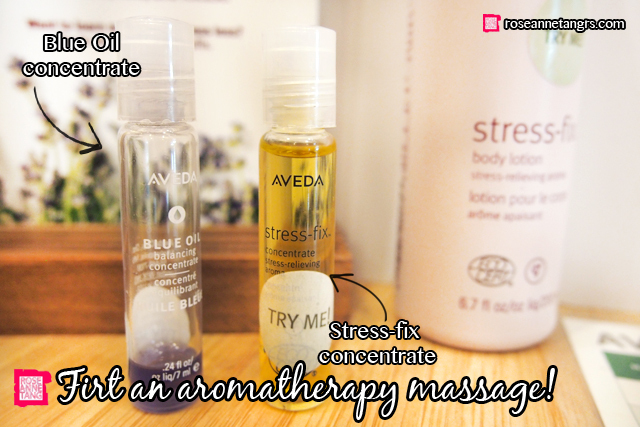 The Stress Fix Concentrate was also very good – it includes organic sunflower and olive oils as well as vitamin E. It is clinically proven to relieve stress! After the very relaxing aroma sensory journey, we then went onto the hair care consultation. Did you know that all of Aveda’s products are botanical based and tried and tested by hairstylists? That’s why they perform so well! 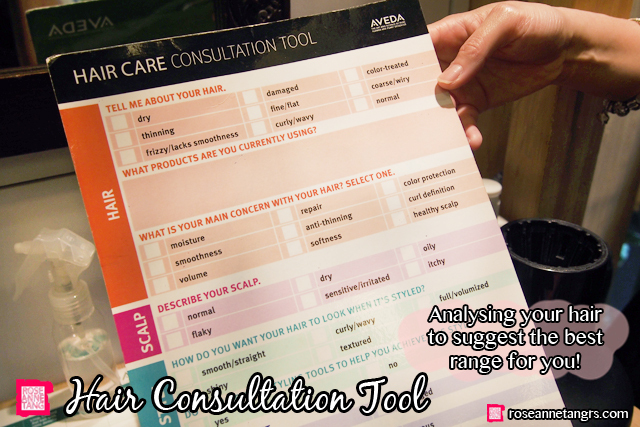 For the consultation, the daymaker does a couple of tests to analyse your scalp and hair type. To test how dry the hair was, she tried to tease it and I have to say it teased extremely easily. 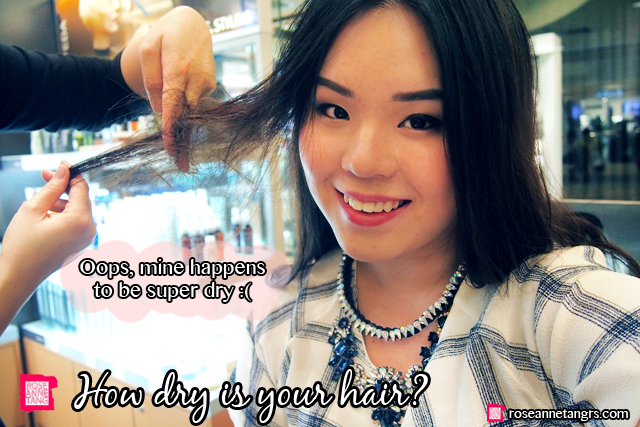 I have totally dry tresses! 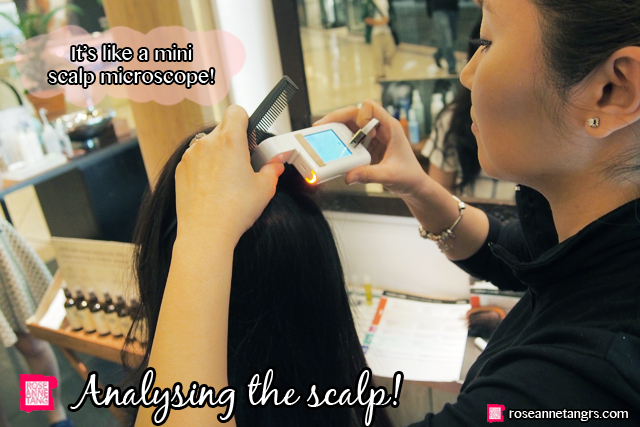 She also had this cool mini scalp analyser that’s kind of like a mini digital microscope. She pushed it into my roots to see the health of my scalp! Oops, I happen to have some buildup and in some areas, my scalp is quite sensitive. After the analysis, I was advised the Dry Remedy range. I have been trying out this range for a while and so far I love it! I love how natural it feels and my hair does seem to be getting more manageable. 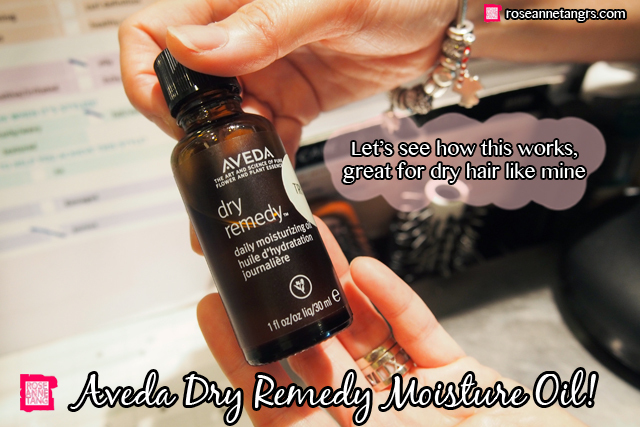 The Aveda Dry Remedy regimen is designed to drench dry, brittle hair with vital moisture featuring a new fresh herbal, lightly floral aroma with organic lavender, bergamot and ginger lily. The secret to Dry Remedy’s thirst-quenching success is their patented Deep-Moisture Complex that features organic buriti oil, pomegranate, and olive oils which moisturize hair – leaving it soft, supple and shiny. It’s a daily leave in treatment that hydrates dry, brittle hair, instantly making it wonderfully soft, supple and shiny. The daymaker used her fingers to comb the oil through my hair. 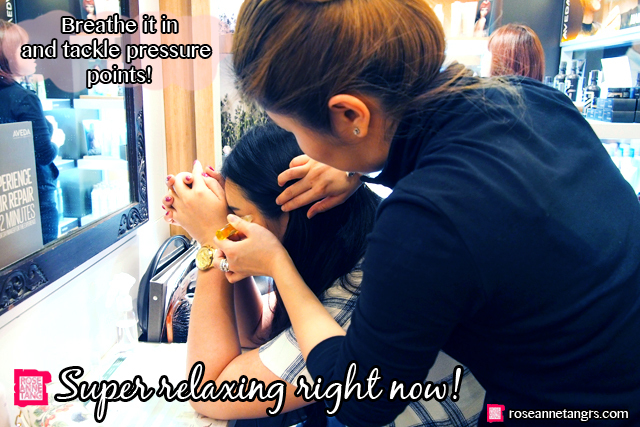 It doesn’t feel very oily which is nice and has a nice scent to it that is very botanical! The effect was really immediate! You can see that it looks much more tamed and hydrated. Because my other side was all curled up because it had no oil applied, the daymaker wanted to curl it again for me. I was kind of confused because there was no curling tong in sight! 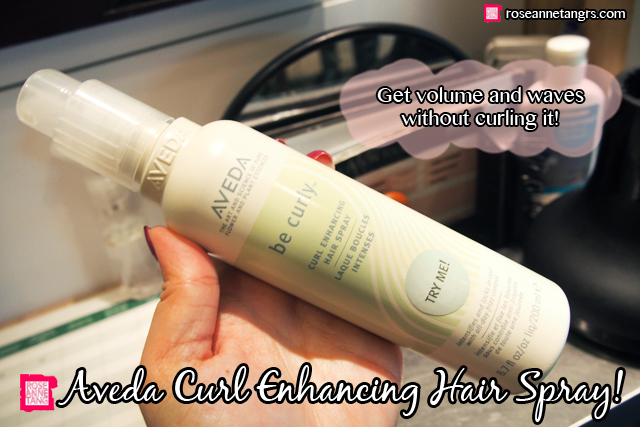 Instead, she used the Aveda Curl Enhancing Spray! The Aveda Curl Enhancing Hairspray provides guests with curly and wavy hair all-day weightless and flexible hold to manage and control their curl, without flaking or crunchiness. Proven to reduce frizz by 20%, the 94% naturally-derived formula delivers natural luster and defends curls from humidity. It was amazing. I never knew how curling sprays work! 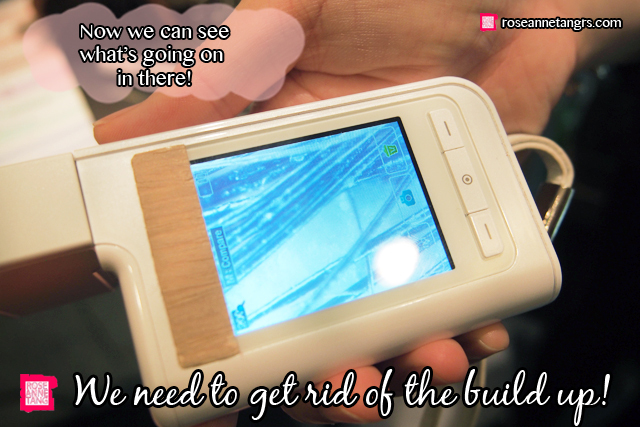 She sprayed it onto a section and twisted the section up. 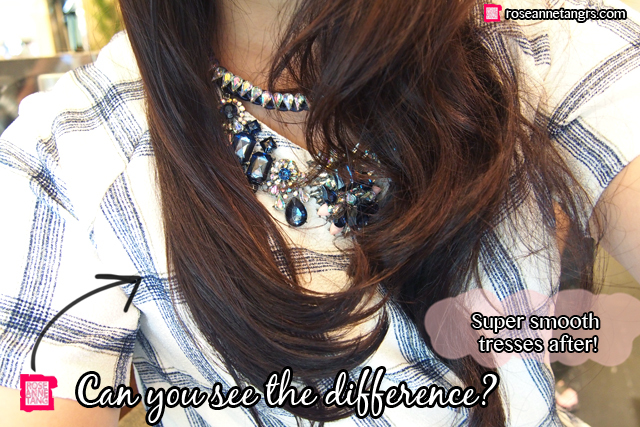 Then she used a hairdryer with a diffuser attached to blow dry it and it became like this! 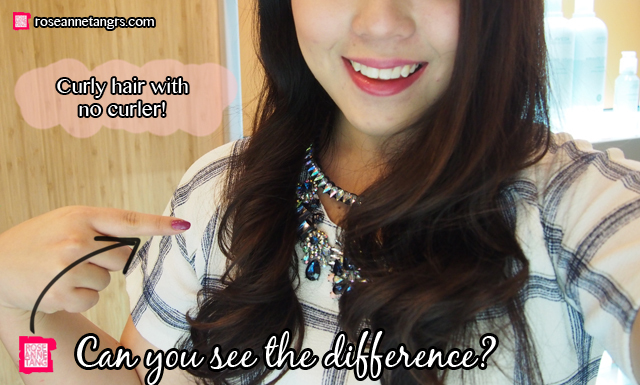 It didn’t take long at all and it’s probably healthier for your hair too! For the last part of my Aveda experience, I was then brought to discover my elemental nature. This is such a cool game that you can play in the store to discover your element. 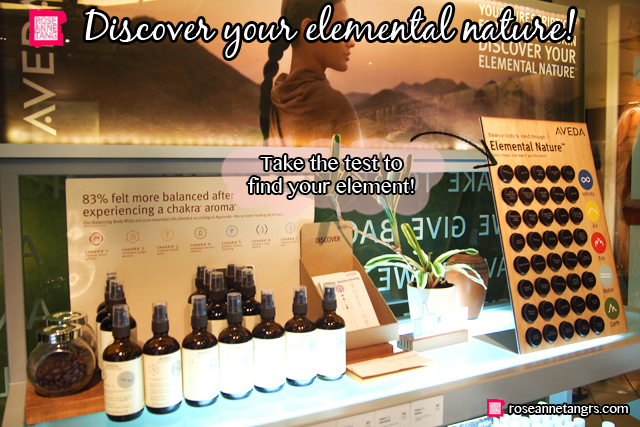 Then after knowing your element, you can find a better match whether it’s to find your chakra aroma or even skincare range. 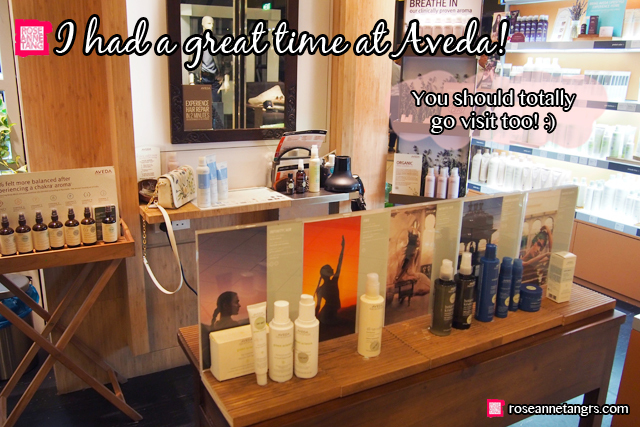 Overall, I had a great time at the Aveda Experience Centre! It’s a great way to get to know what Aveda is all about because there really is so much more to it than just the great products. You can go ahead to their store at Ngee Ann City #B1-32A to find it and experience everything you saw in this post at no expense!